In a previous post I discussed extensively on the value of canonical, or church, records, especially those left by the Spanish friars. Without a doubt more than 90% of my genealogical research has been through church records. I have been able to extend most of my family lines from 8 to 14 generations because of the help of baptismal, marriage, and death records from the churches where my ancestors were baptized, married, or buried. I always knew there was something to be discovered from government civil registrations - births, marriages, and death records still but done in the municipal or city registrar's office - but I have never been excited enough to look at these records. Only recently have I been able to see their value: for information about more recent ancestors, like a grand or great-grandparent, these civil records may not have enough data like those of the Spanish-era church records but they still fill in some gaps. And that is what's important; tracing family trees is like a detective job. You have to look at every possible record to get a clearer and more complete picture of your family. As an example of the value of civil records let me use one maternal and one paternal great-grandparent to illustrate my point. Since my grandfather was still alive for many years when I started doing my research I was lucky enough to get a lot of details about his mother - my great-grandmother - Anacleta Birondo de Lucero. Nanay Tita, as she was known to the family, died at the prodigious age of 93. My family has always told me she died due to old age, and since I had all the details about her life and death I never really bothered looking at her death record. 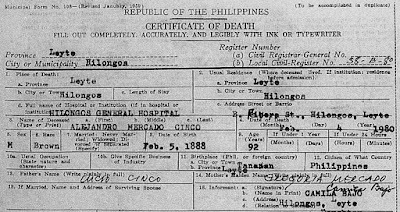 Recently I finally had the chance to check her death record, and I was surprised at the cause of death listed in her death certificate (see below). Though it is obvious she died from cerebral apoplexy (or stroke) and this can be due to her old age, what I find really interesting is the mention of the 30-minute interval from the onset of her stroke to her death. When I write her biography I can at least write with confidence that she suffered very little when she died. This tiny piece of record has given me the final data I need to write my Nanay Tita's biography. A portion of my great-grandma's death certificate showing cause of death. Again, I was lucky enough that my dad's mom, Beatriz Cinco Sales, was still around (and still is) when I started to do my paternal genealogy. Although I had very little luck getting more than 5 generations on my paternal grandmother's tree I got a few more data from church records. The snag I hit was when I started tracing her dad's side of the family. 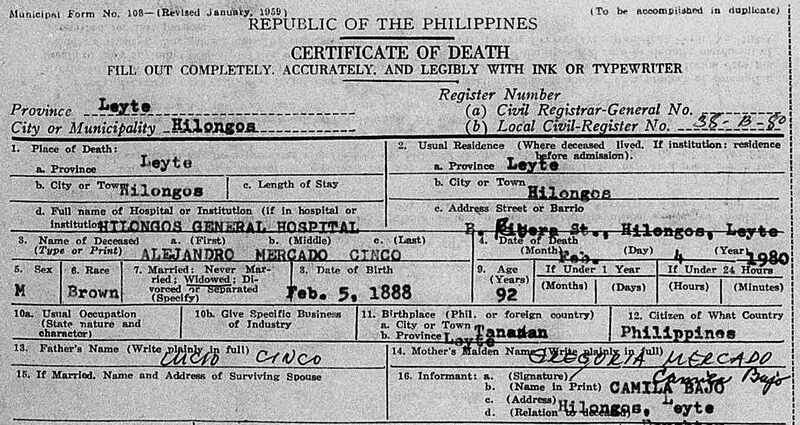 My great-grandfather, Alejandro Cinco, was born in Tanauan, Leyte but the church records there were all destroyed by both time and war. So for many years I only had his name and a little information I got from my grandmother. Later my grandmother's older brother sent me a letter giving me a few more details about the Cinco family. I finally got a name for his parents - Luciano Cinco and Gregoria Mercado! At that time that was enough for me. But when I started to learn the value of getting actual documentation as proof of my research I looked far and wide for any mention of his parents. 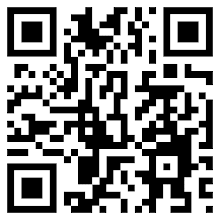 Finally, by a stroke of luck I got hold of his death record (see below). We always knew his birthday was in February but no one could remember when in February, exactly. So when I got his death certificate I finally added a little more detail into my great-grandfather's record. His certificate shows, finally, the name of his mother and father and his date of birth. Validation, at last! A portion of my great-grandfather's death certificate. I guess what I am trying to say is this: all records matter. Though some records are obviously more detailed than others there are still some things that even a detailed record may not reveal, only to find this information in another, seemingly useless record. For a clearer, more complete research one should look at all types of records.